aspect of journalism. 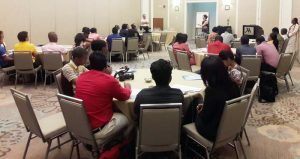 This was amplified yesterday during the start of a three-day Digital Multi-media workshop at the Marriott Hotel in Kingston, Georgetown. The workshop, which materialized through collaboration between the Ministry of Public Health and the Pan American Health Organisation/World Health Organisation [PAHO/WHO], is aimed at helping local media outlets to more efficiently disseminate their messages. Among the facilitators who enlightened media representatives yesterday was Freelance Journalist, Ms. Ljiljana Hoffman. 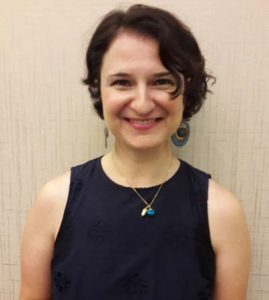 Hoffman, who resides in the United States, is a key player behind a Start-up Company and she also functions as an Adjunct Faculty at the University of Maryland’s School of Journalism. The Serbian-born Hoffman has over the years worked with many international journalists from many countries. Speaking to Kaieteur News during a break at yesterday’s workshop, Hoffman said that her main role is usually not to judge the path that media houses take in their quest to reach their audience, but rather to enlighten them about ways to maximize the various available means. It was at this juncture she noted that it is important for the print media to be able to recognize that there is a vast difference between print and online publications. This difference, she noted, includes the fact that the version of an article printed in a newspaper could be confined because of the space limitation, but additional information and even other interactive multimedia facets could be added online. In fact, she stressed that an online article could be fashioned in a format to capture the attention of a wide audience. “The headline online should be different because of how people search by Search Engine Optimisation such as the Google search engine. The workshop in session yesterday. But according to the career journalist, the print media should not gravitate to online presentations to merely join the bandwagon. “I don’t want to say ‘oh because everybody else is going online you should too’. You have to know your audience and if your audience wants print keep it. If your audience is still buying the newspaper and cares about it and will take it in the morning, you keep doing that,” Hoffman asserted. But there are many advantages to sustaining an online audience. According to Hoffman, a newspaper outlet can easily attract the Diaspora by disseminating news online. “If you want to attract Guyanese people who live in the States or Latin America or just inform the world…in the US we don’t hear an awful lot about Guyana, maybe you can be our source of news of what’s happening in the country,” added Hoffman. Hoffman yesterday described being able to share and learn with other journalists an inspiration, even as she asserted that trying new things sometimes is all about trial and error. “There is nothing wrong or bad about trying. You can fail and try something else. The beauty about online and digital media is that you can try different things to see what sticks with your audience…all I’m saying is that if you hit that status quo and you are satisfied, you should always challenge yourself to try something new and get more audience,” asserted Hoffman. In addition to interaction sessions which shed light on the importance of multi-media storytelling, yesterday’s segment of the workshop also included a segment on photo-journalism facilitated by PAHO/WHO recommended journalism experts Messrs Ary Silva and Davis Spitz. The workshop will continue today with topics such as: Data Visualization, Video and How to tell a story with Video. The final day will entail participants being engaged in a multi-media project.